Most of you work hard to climb the ladder of success but fail in the long run. Despite all the efforts, you feel that you are lagging behind and victory is nowhere close to you. But, at times, you yourself tend to make a mess of your professional life. And one of the reasons behind it could be your stars or your zodiac sign. 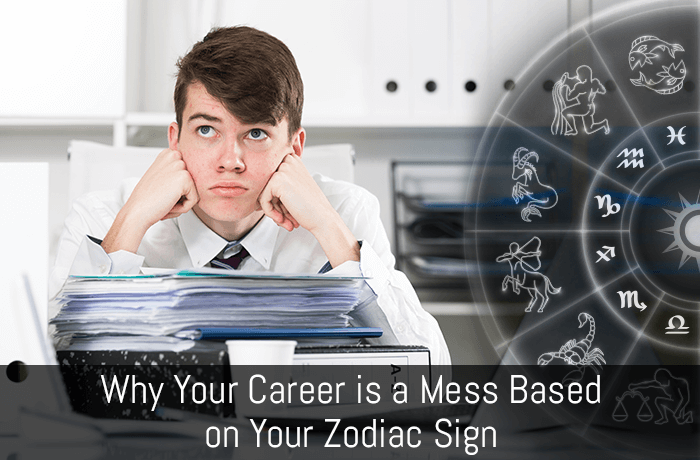 As per daily career horoscope, there are few prominent mistakes that every Star sign makes at their workplace which could hamper the career growth. The article below will talk about how your zodiac sign holds you back from tasting the fruits of success. Your bosses always appreciate your energy and go-getter attitude. As per Aries career horoscope for this week the planetary position along with your cardinal sign makes you a self-starter but does not guarantee completion. However, you tend to lose your focus at times because of your desire to do multiple things at a time. Avoid multitasking, and concentrate on one project at a time for smoother and faster growth, advises Aries career horoscope. Your Earth sign marks your loyalty towards your work. You are more apt for desk jobs with fixed working hours and a set routine, but when unforeseen tasks come, you tend to freak out a little bit. At times you handle work effortlessly, but you may also feel stressed out under pressure. Learning how to manage pressure and being flexible will help you move up on the success ladder. Being a Gemini, you enjoy a particular inclination towards technology which makes you a social media whiz; however, on the other hand, you are also appreciated for your intense performance in sales and marketing jobs. You dual-sided personality helps you win over difficult situations by getting the best out of you. Unfortunately, leaving your personal life at home is quite difficult for you; and you are often seen chatting with your family members during office hours, which hampers your performance in the long run. Ruled by the Cardinal sign, Cancer is the mother of all Zodiacs. You enjoy a highly emotional tendency along with natural empathy. However, unlike other zodiac signs which are ruled by the element Water, you are highly vocal and intense about these emotions. As per career astrology, your cardinal sign makes you highly demanding which acts as an obstacle between you and your success. Learn the art of asking nicely and don’t be reactive in nature. If you can work on these two factors, get success in career life with progression will be smooth for you. Your passion for making a difference with your creativity is what your employer appreciates about you the most. Being a fixed sign, you are highly loyal towards your work, but it is often mistaken for stubbornness. A little flexibility and adjustments here and there will make you the king of the jungle and bring success in no time. As per free career horoscope, your detail-oriented nature makes you obsessed with flawless arrangements including your refrigerator and closets. The Earth sign makes you the most reliable person with strong work ethic. At the workplace, you are often treated as the Dependable one. For better results, try to focus on important things rather than getting carried away by little things and focusing on the irrelevant. As an air sign, you are always brimming with some brilliant ideas. You know how to use your words smartly but are also find compromising and negotiating with job opportunities. Your colleagues do not always appreciate your high level of thinking. Be more open-minded to match the abilities of your co-workers to enjoy a positive work environment. You are ruled by the 8th house of intimacy and secrets. Your fixed sign makes you perform well in psychic jobs. You are good at finding facts and doing research work. Your highly sensitive nature is your biggest enemy both at the workplace and at home. Never bring your fears to the office; it may end up being your biggest opponent. You are a mutable sign makes which you a highly adjustable and creative worker at the office. You know how to perform well in different circumstances. Your ruling planet Jupiter makes you a great thinker. A flexible working environment is what is appreciated by a Sagittarius who cannot work in boundaries. However, your constant habit of looking out for new things might put you in difficult situations at the office. Properly balancing your responsibilities along with your nature will help you succeed in professional life. You get your bossy and authoritative nature from the cardinal Earth sign. You mostly prefer jobs with fixed working hours and a steady income. However, your constant greed for higher status can turn against you in the long run. Capricorns are often seen dictating things rather than inviting ideas from others. You always have a specific way of completing various tasks. Appreciate other ideas to lower down the pressure at the workplace and elevate yourself to the next level. Aquarians are born thinkers. Your ability to come up with inventive and out of the box ideas bring you into the limelight in office. Ruled by the planet Uranus, you are highly emotional which might at times put you in difficult situations. You are often stuck in your emotional world, which keeps running in your mind always. Be a good listener and accept other people’s ideas to perform well at the office and climb up the ladder quickly. The mutable water sign makes you a dreamer. Your mind is often filled with several thoughts which makes you lose focus on essential things. You are an ill-fit for fixed jobs and perform well in a flexible environment. You tend to get carried away by office politics, feels career horoscope. Stay focused on your work to enhance your productivity. Now that you know what is holding you back on your journey of success as per your Zodiac sign, work on what you lack in. Stop doing the wrong thing to reach your goals. Learn to change your work habits and strengthen your relationships with your co-workers to climb higher. Keep an eye on your career horoscope for more guidance.